From Wikipedia: Leucism (occasionally spelled leukism) is a general term for the phenotype resulting from defects in pigment cell differentiation and/or migration from the neural crest to skin, hair, or feathers during development. This results in either the entire surface (if all pigment cells fail to develop) or patches of body surface (if only a subset are defective) having a lack of cells capable of making pigment. 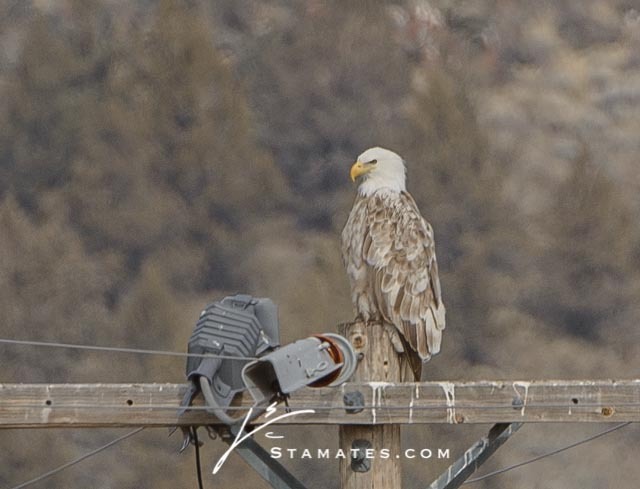 This bald eagle has returned for the past several years to a location near Klamath Basin NWR, Oregon. I learned about it on my last trip to Klamath for the Winter Wings Festival. I was guided by Jordan and Aurora from Leo’s Camera Shop to an area where it was last seen. We searched the skies and perches in the area to no avail. The next day would be my last in Klamath Basin. I woke early for the morning lift off of thousands of tundra swans and snow geese. It was a great morning. As I made my way around the wetlands the sun rose warming the cold morning air. The thought of seeing the leucistic eagle was still on my mind. Okay, one last attempt I thought as I headed my van toward home. I made the detour to the area we searched the night before. Just as I was nearing the end the farm road toward the highway home I spotted it! Long lens, D800E, and a huge crop produced this I.D. shot. This is the first full body leucitic bald eagle I’ve ever seen, and I had the chance to grab a shot or two before heading home and to the bobcat adventure below.